Today my friend David and I went to see Cedar Point for BooBuzz 2010. BooBuzz is an annual coaster event organized by CoasterBuzz.com for its member and their guests. This was the first time either David or I have attended. After registering and getting our meal tickets we headed to Millennium Force at 4:00 for an hour of ERT. We were very disappointed that they were running two of the trains with water dummies. As a result we were only able to get six measly laps in an hour. While waiting between trains I took the opportunity to introduce myself to Carrie Myers and Jeff Putz from CoasterBuzz.com. Next we were off to Happy Jack's Toy Factory in the Disaster Transport building. Dan from Cedar Point's Live Entertainment told us a host of facts about the haunt, its origins and other Halloweekends trivia. After the talk from Dan we were allowed to walk through the toy factory with all of the light on. We were able to take our time and look at all of the artifacts and props. Once we reached the exit we were then permitted to walk through again, this time with only the effect lights on. Click here to see all my pics from inside Happy Jack's Toy Factory. It was now 6:00 and time for our catered meal. David and I walked to the Convention Center near the beach. The buffet offered hot dogs, hamburgers, baked beans, potato salad, huge cookies and kettle corn, among other goodies. Since it was a Halloween event they also offered gummy worms. During the meal we saw John Hildebrandt, Cedar Point's Vice President and General Manager chatting with folks at the next table. Jeff Putz and his family along with Carrie Myers were seated at the table to our other side. The meal concluded at 7:00 and we were free to explore the park for the rest of the evening. Around 7:45 we watched the Overlord let loose his minions upon the park from his post high above the midway. 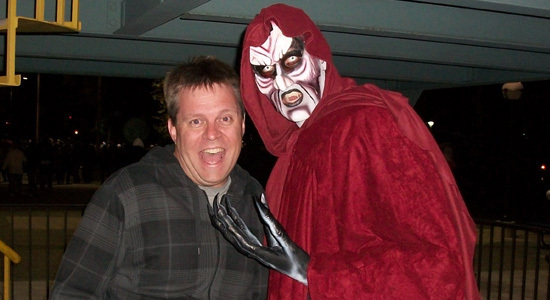 I was then able to pose with the evil master. David and I spent the rest of the night riding and taking in the haunts. We were able to get into Fright Zone, Fear Faire, Terror Island, Cornstalkers, Dr. D. Mented's Asylum for the Criminally Insane, Club Blood and CarnEvil. David and I had a great day at Cedar Point and BooBuzz 2010. I'll be sure to take advantage of this coaster event again next year. Tomorrow... more fun at the park and an exclusive gourmet meal inside one of the haunted houses.